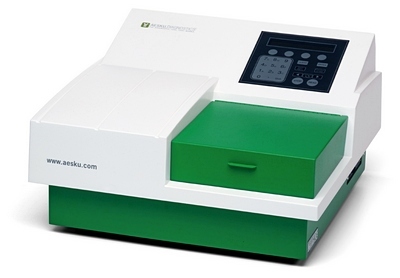 The AESKU® Absorbance Microplate Reader can be used in conjunction with the HELMED® ELISA software, as well as a standalone unit. The external software named Gen5 Data Analysis Software is inclusive. Using the plate layout from the HELMED® ELISA Processor will carry all the information from your sample, lots, automatic processing data etc. AESKULISA® tests are preprogrammed for the HELMED® ELISA Software and AESKU.READER Software. Define and select your report style and view or print the results. Tightest specifications during microplate reading: Precise, accurate and repeatable. The on-board diagnostic self-test and calibration test plate makes it easy to confirm and document reader performance. The AESKU.READER Software is specially designed to communicate with the HELMED® ELISA Software and to semiautomat the use of AESKULISA® reagents. This software manages the data of the HELMED® ELISA and the results of the AESKU® Absorbance Microplate Reader.